In March 2000, a fellow named Mike got in touch with me and invited me to come check out a drain he knew of near Yonge and St. Clair (Toronto) one night. Mike was a very interesting fellow; he was part of some sort of intelligence gathering unit in the Canadian army, and he had done a lot of amazing things and been in a lot of amazing places. He struck me as pretty much ready for anything, so I tried to follow his lead. We were a little disturbed by this slime under the cemetery. 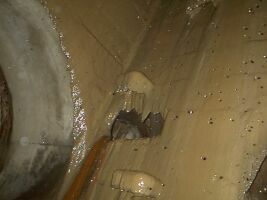 We pried open the 2-meter-wide grate to the St. Clair drain without much difficulty and proceeded up the pipe. Before long, we crossed passed through a very old-looking (1918) section of drain made of huge stone slabs. Some portions of the roof and walls had fallen onto the ground. We then came to a stretch where some very unpleasant brown slime was dripping down the walls and forming stalactites on the roof. Mike informed me that at this point we were under the cemetery. After an hour or so of twists, turns and tunnels not taken, we wound up in a horseshoe- or mummy-shaped tunnel, something I'd previously only read about in Il Draino. Moving right along, we soon came to a section of the drain that was quite flooded with deep, cold, rapidly-flowing water. Mike told me that this section wasn't usually so flooded, and that he wanted to press on and see if the water level went down enough that we could continue to an interesting exit he knew about. I was feeling pretty sick for some reason. I didn't want to get soaked, but I also really didn't want to go back the (long) way we'd come in, so I accepted Mike's offer to scout ahead and see if we could continue. We agreed that he'd take a glowstick, and that he'd either come back if the route was impassable or give me a signal if I should follow him up the flooded drain. 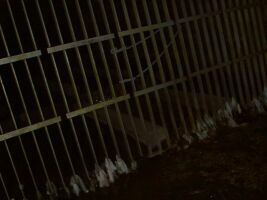 So Mike set off while I leaned against the side of the drain and watched the beam of his flashlight slowly move further and further away until I couldn't see it anymore. 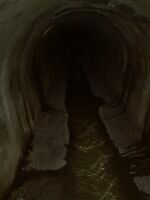 I stood there feeling cold, wet and sick, and, as time passed, more and more concerned about the fact that I was alone in the drain with no idea how to get out. After around 20 to 30 minutes of this, I noticed a green glow coming down the pipe towards me, fast. Soon enough, my glowstick had floated all the way back to me. I eagerly snatched it up and slightly less eagerly plunged ahead into the deep, rushing water. After about 15 minutes, I saw a flashlight beam up ahead, and soon I had joined Mike before the entrance to a very, very small side tunnel. I say "side tunnel" but I'm being generous; in actuality, this thing was just a thin pipe, not more than two feet in diameter. 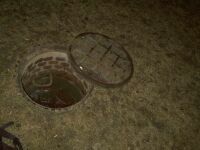 A raccoon could walk through it easily enough, but it was clearly not meant to accomodate humans. In fact, if Mike hadn't tossed his backpack ahead of him and begun to wriggle up the pipe, I might have assumed it wasn't humanly possible. I thanked god I hadn't had a lot to eat that day and began to slither up afterwards, thoroughly battering my knees and elbows in the process. About ten minutes later we popped out of a manhole in the middle of a parking lot  cold, exhausted, soaked, scraped, bruised and triumphant.